5th March 2018. A trophy has been commissioned by the National Coastwatch team at Portland Bill for the angler who won the annual Heaviest Weight in Open Boat Competition. 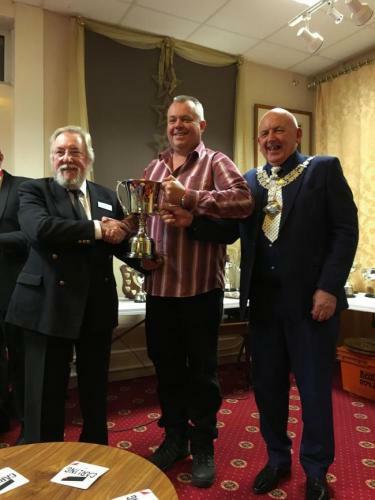 The Coastwatch trophy was awarded to Portland Angling Club member Steve Goodwin and Geoff Peters the Station Manager at NCI Portland Bill, had the honour of presenting him with a rather impressive trophy. Over the years Portland Angling Club and the volunteers of National Coastwatch Portland Bill have formed a very close relationship with the anglers being prepared to ‘strip off’ on two occasions to produce calendars which were sold in aid of the station. However, everyone had their clothes on for the club’s annual presentation evening held at The Conservative Club in Easton. The Mayor of Portland, Cllr Charlie Flack, presented the trophies to members of the Angling Club for their various record catches - with some anglers catching fish Cllr Flack or Mr Peters have never heard of. Mr Peters said: "Well done to all the winners and thank you all for your continued support, you know Coastwatch will be keeping watch whilst you are fishing around the Bill endeavouring to win the Coastwatch Trophy in 2018."